I think the Wooky is the cutest thing ever! Tweeted about it @wonkycritters, am following you on twitter and have been a facebook/etsy fan for quite some time. And I am torn between Rain and Geoffrey as my favorite items in your shop. I would love to win a monster! Hey hey hey... Here is Curious little bird blog ! The black and white is very very nice. I Like so much the fabric you use. aw I love greg the pillow monster! but they are all adorable. 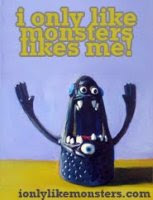 Looove your monsters!! But my favorite ones are the pillows, specially the Snowy the Yeti Pillow, it's so cute!! I "Liked" Curious Little Bird on Facebook. I like the owls, I just can't pick a favorite!! !